Aaron Polsky takes command of Harvard & Stone. Ever since Houston Hospitality’s Harvard & Stone opened in 2011, it has been nominated for a Tales of the Cocktail Spirited Award, one of the cocktail industry’s most prestigious, every single year. In 2012 the rock n’ roll craft cocktail bar was up for Best American Cocktail Bar as well as World’s Best Cocktail bar, and then for Best High Volume Bar from 2013 to 2015. But alas, Harvard has never brought home the honor. However, things may change this year. Because new bar manager Aaron Polsky. He’s vowed to get the East Hollywood bar in award-winning shape. Sure, that’s bold talk considering he just started working at H&S last month. Yet his enthusiasm for the bar makes it seem plausible. Awed by its rock n’ roll live music, Honky Tonk Nights, R&D bar, well-made cocktails and bar family, Harvard & Stone was the first bar he fell in love with when he had visited L.A. for the first time back in 2011. And then this year serendipity put him in charge of it, just when he was about to leave his position at Clifton’s Cafeteria. Polsky, who was trained by Sasha Petraske and was the beverage director for the Project Group in New York, actually moved to L.A. last year to open and run Shadowbox, the highly anticipated high-concept basement bar in Clifton’s. The one that was already being compared to the James Beard award-winning Aviary in Chicago. However, after months had gone by past that bar’s projected open date and key players like Director of Spirits Damian Windsor and Monarch Bar Manager Chris Amirault bailed, he started reevaluating the situation. And that’s when the opportunity to become Harvard & Stone’s new bar manager popped up. “A few things became evident to me that also coincided with the opportunity that arose here that basically made this a no-brainer for me. I love this bar, it’s my favorite bar,” he says. 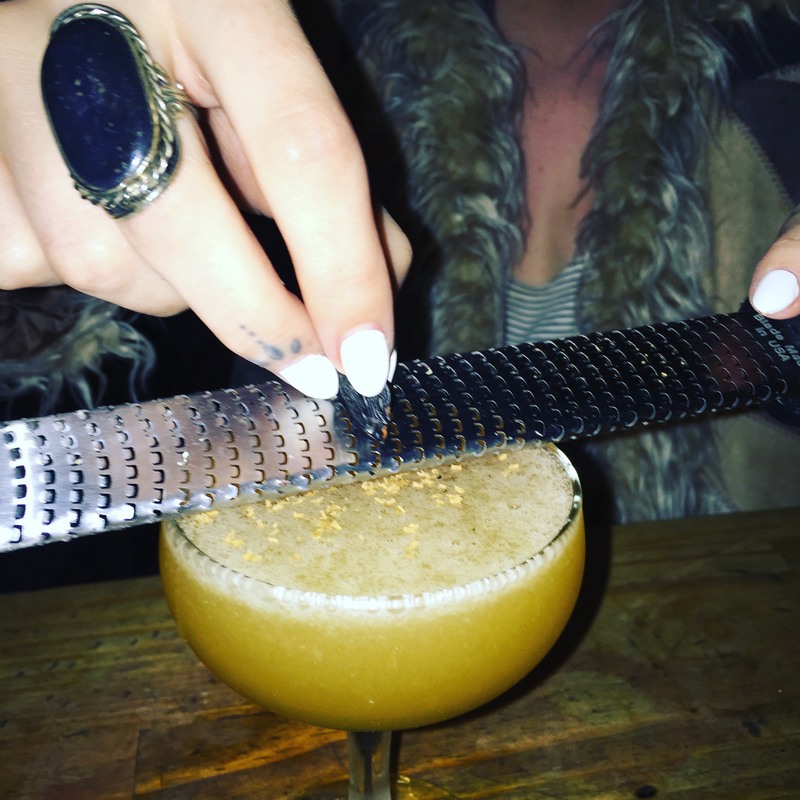 From Harvard & Stone’s Instagram: Aaron Polsky’s 25 Karat Gold cocktail in the R&D bar. 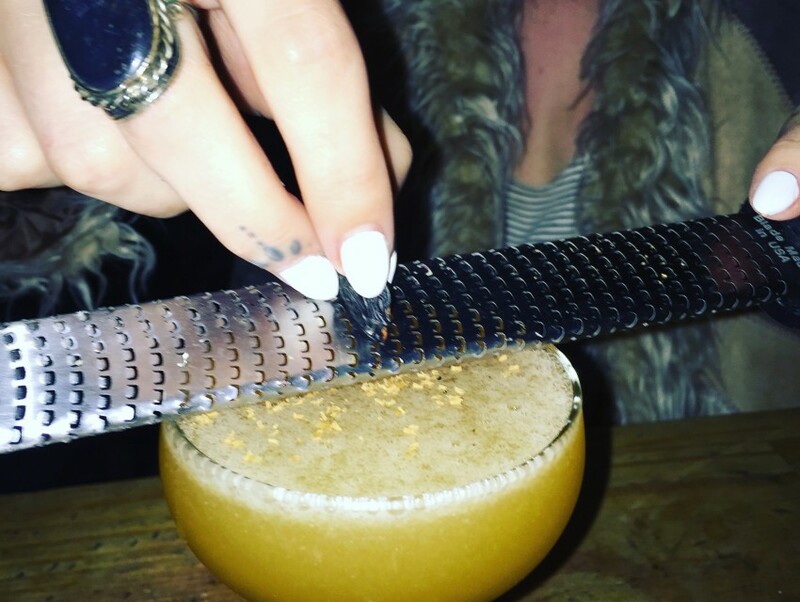 1) Instagram star: He’s Instagramming the unique and fun cocktails created in the R&D back bar, which is often overlooked or merely regarded as a satellite bar precisely because it’s in the back. Not many people realize it’s where all the magic happens, whether with the one guest bartender one night or the adventurous regular bartenders the rest of the week. “R&D is a way to take risks. You’re not necessarily committing to anything,” says Polsky. 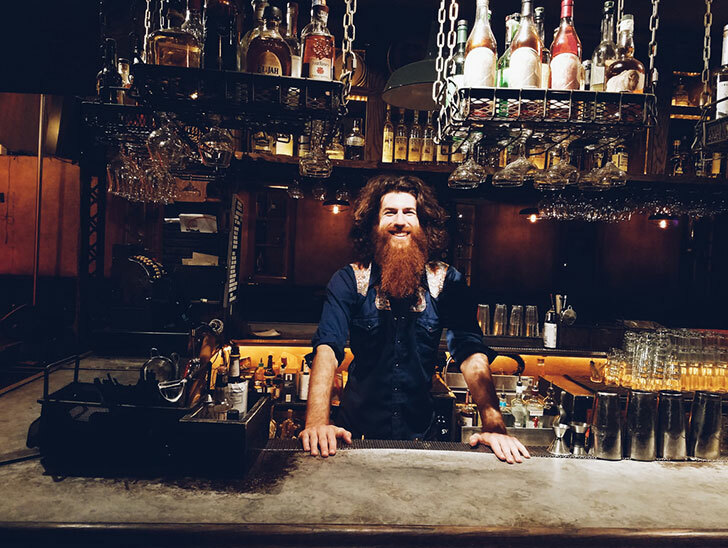 “But for our guests R&D is going to become a sort of treat to work in.” Combine the free rein to take risks, a beautiful agave and whiskey selection, as well as a budget to play with, and there are amazing one-off cocktails coming out of that back bar every night. “People need to know how awesome, tasty and delicious they are,” he says. More Instagramming as well as a sign over the door and aesthetic accents will hopefully make its identity more pronounced and therefore no longer the worst-kept secret in the industry. Ultimately, it’s all about the love and not so much the accolade. “I want people to be surprised and delighted by the truly incredible drinks that they have here in the setting where they can do all the fun bar things they love to do and listen to great music,” says the bar manager. But if Harvard & Stone does manage to score that engraved crystal plate, then bonus! Nominations for the 2016 Spirited Awards ends April 30.